In response to farmer concerns about the effect of wheel traffic on alfalfa yields, we began a study to look at these effects. Studies were established at the UW Arlington Research Station and ABI Research Station (Napier, IA) during the spring of 2000. In a second study started in 2001, plots were established in Iowa, New York, Wisconsin, Minnesota, New York, Nebraska, Oklahoma, Kentucky and South Dakota. Wheel traffic was applied five days after cutting by driving approximately a 100-Hp tractor across the plots covering the entire plots with both wheel tracts. This was an attempt to simulate driving over the field with tractor, chopper, and wagons, or tractor baler, and wagon. In the 2001 study, wheel traffic conditions were the same except that treatments were no wheel traffic, wheel traffic 2 days after cutting and wheel traffic 5 days after cutting. The yield for the first study conducted at Arlington, Wisconsin and summed over 3 years for each entry comparing wheel traffic to no wheel traffic is presented in the graph to the right. While all varieties showed some yield reduction due to wheel traffic, some entries were less affected than others. 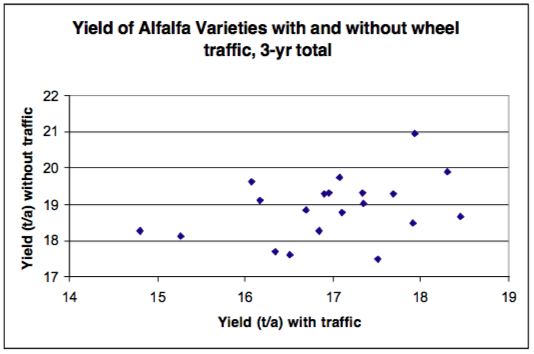 A number of varieties yielded up to 1.0 t/acre/year less with wheel traffic than the same variety without wheel traffic. Based on the data from this study and the consistency of ranking across years, we have begun a variety trial with and without wheel traffic. Yield reductions due to wheel traffic can be related to physical damage to the soil and plant. Deep soil compaction is related to axel weight and surface soil compaction is related to contact weight (weight per surface area of wheel contact with soil). Wheel compaction usually only occurs on heavier soils. Wheel traffic damage to alfalfa crowns may result in cracking or breakage of the crown, which will reduce the shoots produced and may allow entry of disease. In five days, shoots will have begun to regrow and if they are broken by wheel traffic this will result in a yield reduction. To the extent that the yield loss is due to damaged regrowth, the sooner the wheel traffic occurs after cutting, the less the damage will likely be. Chopping for silage at 1 day after mowing may cause less yield reduction than baling 4 to 5 days after mowing. We set up a multi-state study to see if yield reductions occurred across a wide variety of soil types and environments. We also include an additional 2 days after cutting wheel traffic treatment to compare silage making to hay making effects. The data are presented in the table to the left. 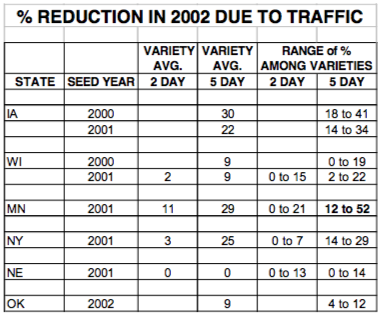 In all cases, except Nebraska, wheel traffic caused a reduction in average yield. There was a variation among the varieties generally ranging from 0% to 15 to 20% reduction. (Data from South Dakota and Kentucky are not presented due to drought.) In all cases, the wheel traffic at 2 days caused significantly less yield reduction than wheel traffic at 5 days. This indicates that, while some of the yield reduction due to wheel traffic is likely soil compaction, a significant portion of the yield reduction is due to plant factors. Harvesting as soon after cutting as possible will reduce the yield loss due to wheel traffic. Plant traffic tolerant varieties (check https://fyi.extension.wisc.edu/forage/category/trial-results/ for test results). Use small tractors when possible on established stands, e.g. raking. Do full wagons have to be hauled the length of the field? If bales are dropped and collected can this be done with less driving? Do no drive on alfalfa field when harvesting crop of adjacent field. Consider using larger harvesting equipment (there is some question about this because while less area is affected by wheel traffic, the affected area has greater weight applied to it). This could be another benefit of contract harvesting. Drive on field as soon after cutting as possible (e.g. make silage from higher yielding fields, hay from lower yielding fields).